It’s a lovely moonlight night, and everyone who’s anyone is making the scene at the Coo-Coo Nut Grove, the hottest nightspot in town. Ben Birdie is leading the band, the rat fink gossip columnist Walter Windpipe is looking for a scoop, and the mood is just right for stargazing. Or, at the very least, for enjoying a general approximation of mid-1930s Hollywood in animated form. Grove marked T. Hee’s first cartoon project–an auspicious debut if there ever was one. The short presents a broad caricature of the popular Hollywood club The Cocoanut Grove, which was located at the Ambassador Hotel (both the hotel and the club were demolished in 2005, and a school was subsequently built on the property). Frequented by celebrities, the Cocoanut Grove was an institution–it even played host to the Academy Awards on occasion. The stars depicted in the cartoon were immensely popular in 1936, but the cartoon comes across as decidedly dated for modern audiences, to whom many of the people caricatured here are obscure at best (after all, how many people outside of classic film circles have heard of George Arliss or Ned Sparks?). 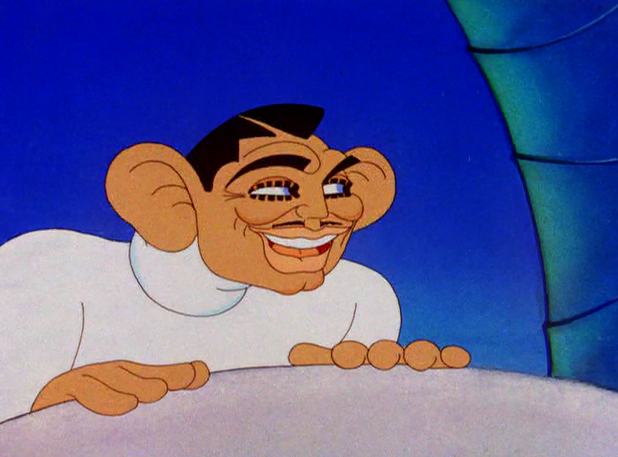 T. Hee’s caricatures in the cartoon are a mixed bag, with some celebrities represented in their exaggerated human forms, while others are morphed into anthropomorphized animal versions of themselves. The representations of the stars range from spot-on (John Barrymore, the “Great Profile,” walks into the club with his head turned sideways, remaining that way the entire time) to almost cruel (Katharine Hepburn, here christened “Miss Heartburn,” is portrayed as a horse, whinnying with delight; Oliver Hardy, in an almost too-easy crack on his weight, is portrayed as a pig). Most of them are easy to pick out, to most classic film fans, at least–the dancing hen boasting Mae West’s … ample chest and familiar breathy voice; Clark Gable is immediately identifiable by his prominent ears, flirting with the incongruous “The Lady in Red,” Dame Edna May Oliver; Edward G. Robinson and George Raft are recognizable by their ever-present cigar and flipping coin, respectively. The entire affair ends in a flood as torch singer Helen Morgan belts out a mournful take on “The Little Things You Used to Do” (from the 1935 Warner Bros. musical Go Into Your Dance); the whole club bursts into tears as she sings, sending all of the tables–and the stars–floating away. 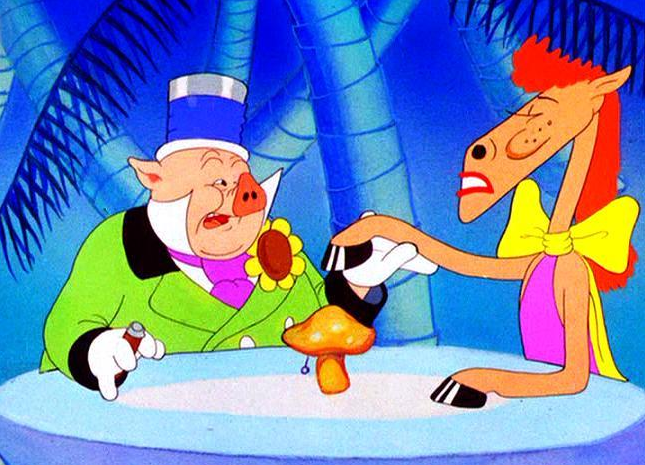 The Coo-Coo Nut Grove kicked off a long career for T. Hee, one that saw him moving from Warner to Disney (where he worked on a number of projects including Pinocchio and Fantasia) to UPA and, eventually, back to Disney. He was a character designer, a stylist, a title designer, a teacher, and–most prolifically–a writer. 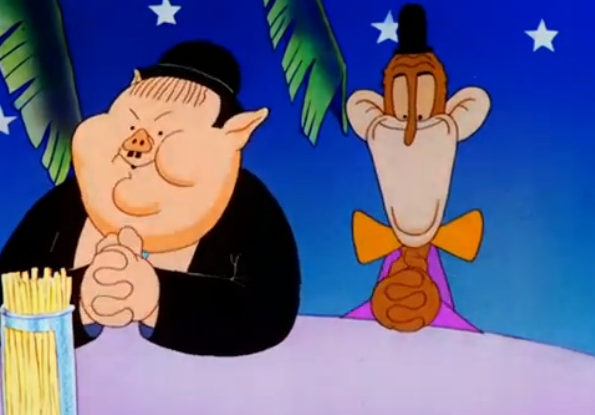 Over the course of three decades, T. Hee had a hand in the creation of some of the most entertaining cartoon shorts and films from the Golden Age, working with such beloved characters as Porky Pig, Gerald McBoing-Boing, and Mr. Magoo. And he remains one of the most skillful caricaturists to emerge from classic Hollywood, with a deft hand and an eye for detail that sets his work apart from his rivals. Audio commentary on The Coo-Coo Nut Grove by Michael Barrier. Looney Tunes Golden Collection: Volume Three, Disc Two. Who’s Who in Animated Cartoons: An International Guide to Film and Television’s Award-Winning and Legendary Animators. Jeff Lenburg, 2006. April 12, 2014 in animated shorts, animation, classic cartoons, hollywood caricature, saturday morning cartoons. Tags: merrie melodies, t. hee, warner bros. This cartoon is a childhood favorite (I’m old enough to have grown up in a time when these vintage cartoons were still on TV daily). Among its many virtues, it was my introduction to Ned Sparks.